Not to be confused with Emil Sitka. Emil "Red" Sitko (September 7, 1923 – December 15, 1973) was an American football player. Born in Fort Wayne, Indiana on September 7, 1923. He was of Polish descent. He earned the nickname of "Red" due to his red hair. He attended Central High School in Fort Wayne. At only 5'8" and 180 pounds he was not considered a big man. "Emil wasn't very big as football players go -- even for those days", Irish coach Frank Leahy once said. "But he was the fastest starting back I ever coached." Emil Sitko served in a military capacity during World War II and did not enter directly into college. Upon coming out of service in World War II, he enrolled at Notre Dame as a 23-year-old freshman. He was a starter on the football team three years at right half and one year at fullback from 1946 to 1949. In those four years the Notre Dame record was 36–0–2. Besides his nickname of "Red", he was known in football as "Six- Yard Sitko." He led his team in rushing all four years and his career average was 6.1 yards a try. In 1949 he also led the team in kickoff returns, averaging 22 yards. He made the All-America teams of the Sporting News and the Football Writers Association of America in 1948 and was unanimous All-America in 1949. 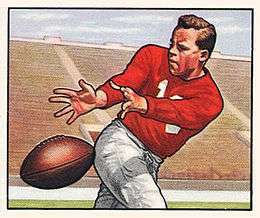 Emil also finished eighth in the 1949 Heisman Trophy voting behind teammate Leon Hart. He also won the 1949 Walter Camp Award as outstanding college player. Sitko still stands seventh on Notre Dame's career rushing charts. Sitko played three seasons in the NFL for the San Francisco 49ers and the Chicago Cardinals before retiring and returning to his hometown to work in the auto sales business. He died in 1973, at age 50, after a heart attack. He was inducted into the College Football Hall of Fame in 1984.